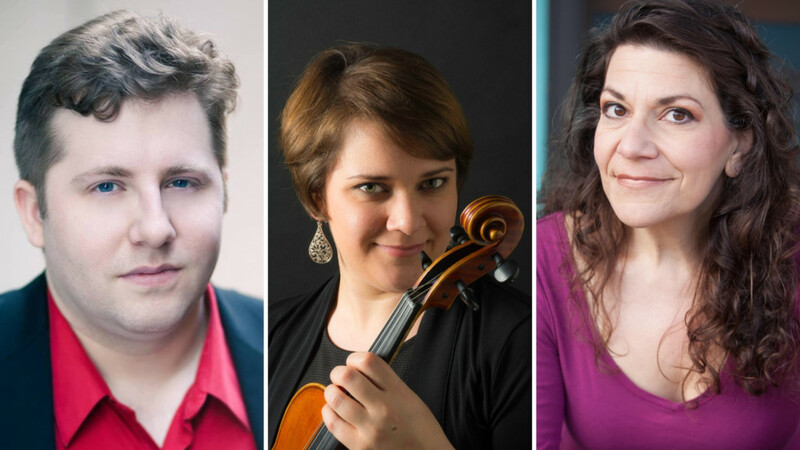 The Bach Parley String Academy presents “Inner Voices: A Celebration of Viola, Piano, and Voice” featuring Phyllis Pancella, mezzo-soprano, Galen Dean Peiskee, piano, and Miriam Tellechea on viola. The concert will feature the music of Johannes Brahms, Charles Martin Loeffler, and Jean Berger. The musical ranges of the viola and the mezzo-soprano are slightly lower than their soprano cousins on voice and violin. They often weave together the harmonies between the soprano and bass lines in the music. This concert celebrates these “inner voices” and gives them their own spotlight and showcase performance. This concert is exciting for Miriam Tellechea, who has dreamed of performing the Brahms’s “Two Songs for Piano, Voice, and Viola” since she heard it as a child. The concert will be held at 3 PM on Sunday, April 7 at Christ Presbyterian Church, 2317 Bannerman Road. Donations are accepted and will benefit the Bach Parley String Academy’s scholarship program. Miriam Tellechea began studying the violin at age six with Melissa Brewer. She received her Bachelor of Music from Florida State University, where she studied with Dr. Pamela Ryan, and she completed a Master of Music in Viola Performance at The Boston Conservatory. She has been a member of many orchestras, including the Tallahassee Symphony. Tellechea is a faculty member at the Bach Parley String Academy where she teaches viola and violin. Mezzo-soprano Phyllis Pancella enjoys doing a little of everything in the world of classical singing. Her opera roles have ranged from Carmen and Adalgisa to Lizzie Borden and Nero, with major companies in Houston, Chicago, San Francisco, London, Paris and more. A highly regarded interpreter of chamber music and art song, Pancella has appeared with Chamber Music Society of Lincoln Center, Chamber Music Northwest, OK Mozart, BargeMusic and for the Prague New Music Festival. Galen Dean Peiskee has established a multifaceted career as an accomplished chamber musician, soloist, orchestral pianist, choral accompanist and vocal coach. He has performed throughout the United States and internationally, and he is a founding member of both the Young-Peiskee Flute-Piano Duo and the Cerulean Trio. Peiskee made his Carnegie Hall debut in May 2017, performing music of Timothy Hoekman in Weill Recital Hall. Peiskee has a Doctor of Music degree in Collaborative Piano from Florida State University, where he earned his Master of Music degree in Accompanying. An additional benefit concert for the Bach Parley String Academy, “Bach on the Guitar, “will be held at 7:30 PM on Friday, April 12 at First Presbyterian Church at 111 North Adams Street. The concert will feature Bach’s Lute Suites and his iconic Chaconne transcribed for the guitar. All donations will help provide scholarships for deserving Bach Parley String Academy students. The Tallahassee Bach Parley is the umbrella organization for a non-profit music school, the Bach Parley String Academy. In 2015, four teachers united to teach violin, viola, and cello at St. John’s Episcopal church, and now the String Academy has grown to six teachers, almost 100 students, and even offers ukulele classes. For additional information about the Tallahassee Bach Parley, including the Bach Parley String Academy music school, visit www.bachparley.org.